Preparatory activities for the upcoming second edition of Joy Bangla Youth Award is going in full swing. Two rounds of divisional meetings – one of the most important pre-event activities – have already been complete. Starting May 20, several teams of Young Bangla, organizers of the award, have simultaneously finished visiting the divisional cities of Rangpur, Rajshahi, Chittagong, Khulna and Barisal. 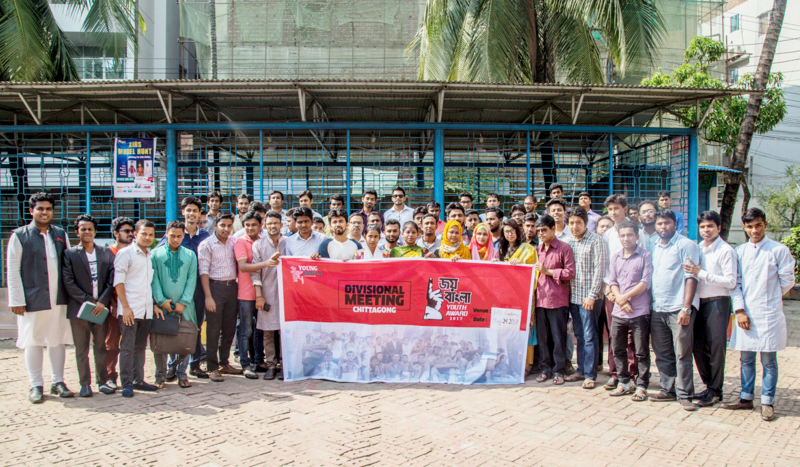 The divisional meetings were mainly aimed at mobilizing Young Bangla’s local workforce – mainly the winners of the 2015 Joy Bangla Youth Award – for successful publicity in the buildup to the award function to be held in Dhaka in the last week of October. Representatives from more than 300 youth-led social, cultural and sports organizations, who are looking to get involved with the Young Bangla platform by applying for Joy Bangla Youth Award 2017, took part in the five divisional meetings. Apart from applying for the award themselves, these organizations will also help local divisional coordination teams – comprising winners of the last award – in carrying out district-level town-hall and campus activations for publicity during June and July. Dividing into separate groups for each district, these organizations will work under the leadership of the divisional coordination teams. The town-hall and campus activations – set to start on June 7 – will look to inform as many people as possible in the respective districts about the upcoming award function by pasting posters, setting up booths, distributing leaflets, screening Young Bangla audiovisual materials and local media dissemination. The second phase of the divisional visits begins on May 29, with teams setting out for Mymensingh and Sylhet. The divisional meeting for Dhaka will be held in the first week of June. Young Bangla, an interactive platform for Bangladeshi youth, will recognize a total of 64 youth-led organizations from every corner of the country by means of the Joy Bangla Youth Award 2017.